Holds a B.A. in Music with a concentration in Piano Performance. Has performed solo for over 5 years as well as with Methodist Univeristy’s Men’s Chorus, Chorale, Jazz Band, Marching Band, Jazz Combo and Chamber Singers. Currently plays and performs with The Band Punch playing weddings and events. 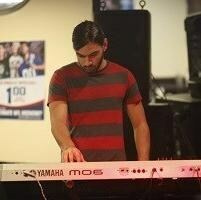 Teaching experience includes piano, guitar and vocal instruction at McFadden Music and Guitar Center in Fayetteville. Also teaches guitar and voice. Request Lessons with Colin today!